Learn how to use Facebook chat from the desktop without being on the Facebook.com website. Other than your desktop, you can also use Facebook chat from the browser or your mobile phone. Facebook includes an awesome chat feature that lets you instantly start conversations with your Facebook buddies without installing any IM software but the only small issue is that you need to be on the Facebook.com website in order to use Facebook chat. If you find this a bit inconvenient, here are some good workarounds that will let you chat on Facebook from anywhere without even having to open the Facebook site in your browser. If you have Google Chrome or Prism for Firefox, you can open this address in your browser address bar and then create an application shortcut to Facebook chat on your desktop. Firefox users may bookmark the above link and set the “Load this bookmark in Sidebar” property to true in order to use Facebook chat from the Firefox sidebar. If you an IE user or hate to use Facebook chat from the sidebar, try Gabtastik – this is a minimal desktop client for Facebook that looks exactly like the web version of Facebook chat but will also send you notifications of new messages and chat requests from the system tray. Meebo, the very awesome web based instant messaging service, now supports Facebook chat as well. You can connect your Facebook account with meebo via the Facebook Connect service (so there’s no need to share your Facebook credentials with anyone) and instantly chat with your online buddies inside the web browser. There are two advantages here – you can use Facebook chat even if the main Facebook.com site is blocked in your office and two, you can simultaneously connect with friends on other IM networks from the same website. ChitChat – If Facebook were to develop a standalone messenger on the lines of Yahoo! or Google Talk, it might look something like ChitChat. ChitChat is a Windows-only desktop client for Facebook that provides a tabbed window to make it easy for you to talk to may friends at once. It will also show notifications in the tray when your friends go online or when they have signed out. The application is in RC stage so expect a few bugs. Digsby – This is again a very useful all-in-one app that helps you stay up to date with everything happening on your Facebook, Twitter, Gmail, LinkedIn and other online accounts. If you have multiple accounts on Facebook (like you and your spouse), you can associate all of them with your Disgsby messenger and chat with the combined buddy list simultaneously. Facebook doesn’t allow audio or video calls but Digsby indirectly brings that feature to Facebook Chat via tokbox. Adium – If you are on Mac, Adium is probably the best choice for you to chat with Facebook friends from the desktop. Like Pidgin and Digsby, Adium too supports multiple IM networks, including Windows Live Messenger, Google Talk, AOL AIM, ICQ, Yahoo! Messenger, Skype, Twitter and Jabber (XMPP). And it uses the same Facebook Chat plugin that is available for Pidgin users on Google Code. Pidgin – While Facebook Chat is not officially supported in Pidgin, there’s a free plug-in that lets you connect to the Facebook chat server from Pidgin. And like Digsby, Pidgin too would let you chat with buddies on multiple Facebook accounts from the same interface. Pidgin vs Digsby – Pidgin is purely for instant messaging while Digsby will also display notifications like when a friends sends you a message using Facebook email or if he or she writes something on your Facebook wall. Some people in the comments say that even Pidgin displays notifications but at least that doesn’t work in Windows 7. Pidgin will show all your Facebook contacts in one giant list (see update) while Digsby will group contacts under logical “Friends list” just the way you have them on the main facebook.com site. 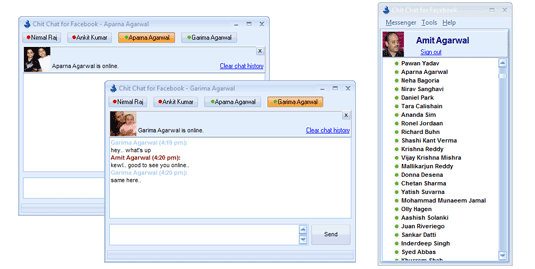 Update: The new version of Facebook Chat plugin for Pidgin displays your online friends under groups just like Pidgin.